The Multi-Display Systems provide ideal merchandising tools for high impact visual displays. They are pipe structures suspended from the ceiling, in either a straight line, a curved line, or in a circle, for the display of three to five television sets. The components are ordered individually to create the specific display needed. All mounts and TV sets on a display must be the same size. Multi-Display Extension Column: ADD Models (Fixed and Adjustable Extension Columns for Ceiling Decouplers). 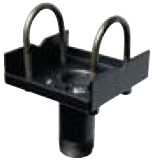 Drop length of final display assembly will vary according to selected decoupler unit. 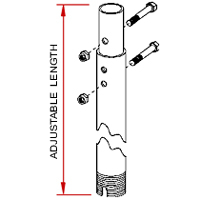 Fixed length columns provide 1 inch to10 inch drop lengths. Adjustable length columns provide 1 inch to 12 inch drop lengths. 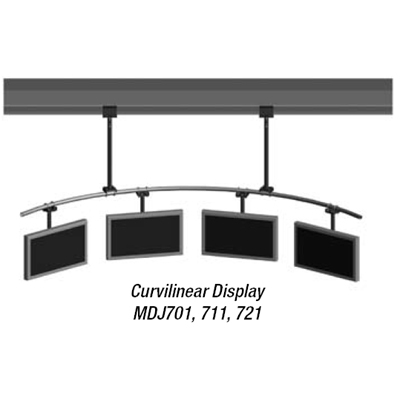 Interfaces between flat panel mount to MDJ mount, and MDJ mount to ceiling support structure. Fixed length columns provide 8 inch to 12 feet drop lengths. Base mount only for up to 71" screens. Requires appropriate extension column, screen-specific adapter and ceiling plate for various ceilings, all sold separately. Large Flat Panel adapter plates (PLP models) are either universally compatible with most large flat panels, or uniquely compatible with one screen make or model. 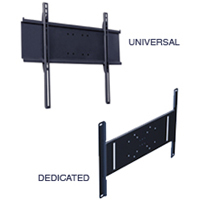 Peerless adapter plates for flat panels allow users to choose between Peerless’ wide array of applications and accessories to mount a flat panel virtually anywhere. Most models feature security fasteners for theft resistance.